EPISODE 13, SEASON 3- "PARTING SHOT"
Well, tonight's episode of "Agents of S.H.I.E.L.D." had made me very sad. 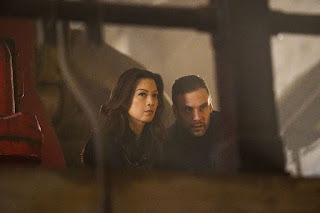 There were a several new characters introduced in the second season of the Marvel show and two that I loved the most were Lance Hunter played by Nick Blood and Bobbi Morse played by Adrian Palicki. I have an off again-on again relationship with Palicki's work, but this is without a doubt, the best work of her career. While I would have loved if Jeremy Renner's Hawkeye didn't already have a wife in this universe, and that Palicki could have popped into a movie and had a romance with Hawkeye. Because I would have loved to see the chemistry between Palicki and Renner. Oh well, ABC and Marvel made up for it because they created a great character with Lance Hunter. I can't tell you anything about Nick Blood, but after this show, I want to see more of him. I hope to see more of them. They were two shiny examples of why I tuned in every week. And now, Bobbi Morse and Lance Hunter are gone. Done. Not coming back, apparently. They didn't die this episode, which I thank my stars for. But at the end of last week's episode, the pair were tracking and following Gideon Malick to Russia. Malick went to go see about the sanctuary Russia is building for Inhumans. When what Malick really wanted to do was take it over for HYDRA purposes, which would result in the murdering of the Russian Prime Minister. S.H.I.E.L.D. couldn't let that happen, so the team sprung into action. Two of the most active participants were Bobbi and Lance, and they both get captured by Russian authorities after the mission. Lance and Bobbi did get the Prime Minister to safety, but Russia did not trust the motives or the timing for the United States. Russia believes they are working with S.H.I.E.L.D. and the world still believes that S.H.I.E.L.D. is HYDRA. The rest of the episode was wrapped around an interrogation of Bobbi and Lance, the Russians were putting on the interrogation pretty deep to get Bobbi and Lance to crack. But they didn't crack. They are S.H.I.E.L.D. tough of course. The President of the United States got involved and was able to convince Russia that they weren't S.H.I.E.L.D. But seeing no other choice for this to go smoothly, Bobbi and Lance had to leave S.H.I.E.L.D. They didn't want to run the risk of escaping, running the risk of the world finding out that S.H.I.E.L.D. is still active. So they left. Now I know, there is a spin-off in the works. Bobbi and Lance were supposed to get a spin-off after season 2. That is why Bobbi and Lance are talking about leaving at the end of last season, but somehow pop back up in the show for season three. It was very sloppily handled, if you ask me. Why take away two of the best characters after season two, just to bring them back for season three due to their popularity, to take them off again? It's odd decision-making, and it lead to an odd story-arc for these characters. I really wished that they kept them on. Despite getting a season four confirmed last week, ratings for "Agents of S.H.I.E.L.D." are staggering a bit. Its a bold move to take away two of the most popular characters in the midst of lukewarm ratings. Malick did bring a Inhuman HYDRA assassin to Russia. One who could use their shadow to fight and absorb matter. I am pretty sure that this is the MCU version of Spot, a comic book villain with similar powers. But nothing has been confirmed yet, and nothing set in stone. But a shadow that could move through walls, travel quick and became pretty much indestructible seems similar. We were also introduced to Malick's unnamed daughter, who seems to be up to speed on her daddy's business. I wonder if this will be the MCU's Madam Hydra? With Zola and Wolfgang von Strucker introduced in the movies, and Daniel Whitehall and now Hive introduced on "Agents of S.H.I.E.L.D." it would make sense to introduce the next high-ranking representative from the comics. Who knows though. A very emotional episode for me, I hope "Most Wanted" turns out to be a great show because that's the only thing that can save this decision. What did everyone else think?